Augie launched WOSO 1030-AM in 1977 and served as the station's general manager until 1994. Augie launched WOSO 1030-AM in 1977 and served as the station’s general manager until 1994. Augustine “Augie” L. Cavallaro II, founder of WOSO Radio in San Juan, died on June 11, 2016 in West Palm Beach, Florida after a long battle with cancer. He was 85. Augie launched WOSO 1030-AM in 1977 and served as the station’s general manager until 1994. Nicknamed “El Oso” (The Bear), WOSO was “Puerto Rico’s English-language Voice of Community Service,” with a 24-hour mix of easy listening music, local content, and U.S. network news. Augie pioneered the use of satellite technology to deliver to listeners in Puerto Rico and the U.S. Virgin Islands live programming from CBS, ABC, and Mutual Broadcasting, featuring such icons as Walter Cronkite, Paul Harvey and Larry King. Augie also showcased San Juan-based radio talent including Ellen Hawes, Bob Clark, Bill Thompson, Harry Sherwood, Christopher Crommett, Mariano Caldern, David Saxon, Tere Ortiz and Wally Pierre. WOSO acquired a loyal following of listeners with locally produced news and feature segments and call-in shows, including Augie’s own “Speak Out” program. An audience favorite was the daily “Genius Question,” which earned listeners a WOSO t-shirt for a correct answer. In the late 1980s, Augie traveled to Central America to report on the civil wars in El Salvador and Nicaragua. In 1989, he led WOSO’s award-winning live coverage of Hurricane Hugo. In 1992, Augie wrote and produced “The Voyage That Changed the World,” a special series based on the diaries of Christopher Columbus which earned him an Overseas Press Club award, one of multiple awards garnered by WOSO under his leadership. Augie was born in New Haven, CT on Sept. 29, 1930, the oldest of three children. After high school, he attended George Washington University while also working part-time for the FBI, transcribing interviews and helping in the fingerprint division. He left school to join the Air Force, and served in Korea and North Africa. After the military, Augie worked in advertising in New York at Young and BBDO, and in television, producing various programs including live boxing and wrestling broadcasts. 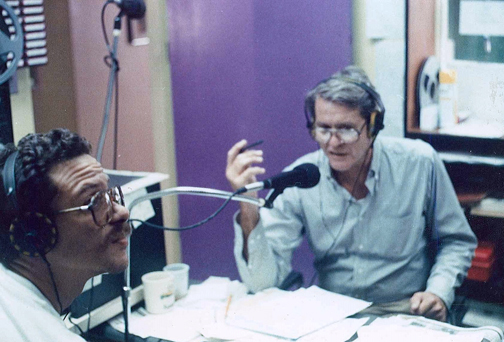 He later ran WTTT Radio in Amherst, MA, and WERI radio in Westerly, RI. In 1965, Augie moved with his young family to Puerto Rico. He produced game shows for WAPA-TV and later served as general manager of WTSJ-Channel 18 working with future TV celebrity Sally Jesse Raphael. Later, as he battled to obtain the FCC license for WOSO, Augie ran his own ad agency and did photography and sales. Augie was also an amateur pilot, tennis player and sailor, and he studied several languages. After Augie left WOSO in 1994, he spearheaded a second English-language station in San Juan, NewsTalk 1560 AM, with his daughter, Gina. In 1996 he retired from broadcasting and spent the next 13 years traveling and living in South America, mainly in Argentina where he taught English and learned the guitar. He is survived by his daughters Tracy Cavallaro, Francesca Cavallaro Wall (Bill), Gina Cavallaro Larsen (Matt), Rachel Cavallaro, Mary McCann and Kim Lacasse; his sons Augustine Cavallaro III and Gabriel Cavallaro; his 14 grandchildren; and his brother, Charles Cavallaro, and sister, Mary Jane McKitis. He was preceded in death by his parents, Frances and Augustine Cavallaro. Augie was married and divorced twice, to Ann Mulligan Cavallaro and Peggy Van Nordstrand, each of whom died in recent years. The family will scatter his ashes in San Juan Bay in a private ceremony. Donations in Augie Cavallaro’s memory may be made to the Peggy Adams Animal Rescue League in West Palm Beach, or the Puerto Rico Historic Buildings Drawings Society in San Juan. A dear person and friend. A wonderful, enthusiastic and impassioned man who allowed for others to be heard and informed by his tremendous efforts to educate and entertain. His family no less brilliant. Hey Buddy!, I found this information for you: "WOSO founder Augie Cavallaro, II, dies at 85". Here is the website link: https://newsismybusiness.com/founder-augie-cavallaro/. Thank you.